Physicists at UC Santa Barbara have created a microscopic device to assist biologists in making very fast molecular measurements that aid the understanding of protein folding. This development may help elucidate biological processes associated with diseases such as Alzheimer's and Parkinson's. Since proteins in the body perform different functions according to their shape, the folding process is considered a key area of study. 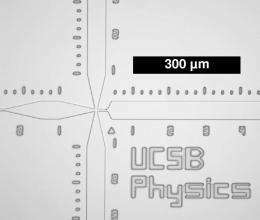 Using a microfabricated fluid mixing device built at UCSB's nanofabrication facility, UCSB physicists and their collaborators from the University of Zurich have made the first sub-second, single-molecule measurements of an essential biological molecule known as a chaperonin. The results are published in this week's online issue of the Proceedings of the National Academy of Sciences. "The genes encoded in DNA contain chemical sequences for proteins, which, once they have been synthesized in the cell, fold into molecular machines that perform the basic functions of living things," said Everett Lipman, co-author and assistant professor of physics at UCSB. "Many proteins can fold on their own, but others are prone to misfolding and aggregation, which are thought to cause neurodegenerative diseases such as Alzheimer's and Parkinson's." Chaperonins are known to assist the folding of other proteins, called substrates, and to prevent aggregation, Lipman explained. GroEL, a member of a large family of chaperonins, works in concert with GroES to encapsulate a substrate protein, isolating it as it folds. Although this process has been studied previously, the mechanism by which the chaperonin functions or fails to function is not yet understood. Single-molecule experiments provide information about protein folding that would otherwise be obscured by averaging signals from the many billions of unsynchronized molecules in a typical ensemble experiment. Until now, the slow speed of manual mixing prevented single-molecule measurements of folding inside chaperonins at times earlier than a few minutes. This is far slower than the fifth of a second needed for GroEL and GroES to encapsulate their substrate. UCSB physics graduate student Shawn Pfeil, working with Lipman and fellow student Charlie Wickersham, designed and built a device that enables single-molecule measurements as fast as five milliseconds. Fluids were mixed in a channel one-tenth the size of a human hair. With collaborators Armin Hoffmann and Benjamin Schuler at the Biochemical Institute of the University of Zurich, they measured the folding of rhodanese, an enzyme responsible for detoxification of cyanide, inside the GroEL-GroES chaperone complex. The results show that -- contrary to what was previously believed -- the fast initial capping of the chaperonin cavity by GroES and the related conformational change of GroEL do not initiate folding of the substrate, explained Lipman. 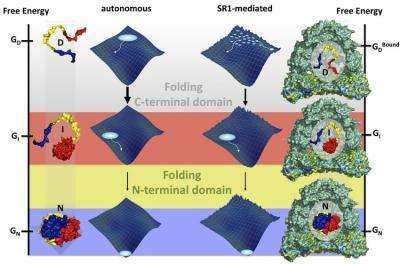 Extensive measurements on time scales from milliseconds to hours indicate that the chaperonin slows the folding of one portion of the rhodanese protein, allowing it to find the correct folded shape while it is protected from aggregation. Further studies using this new method may help to determine whether the failure of chaperonins is responsible for pathogenic aggregation, clumping of protein, that leads to disease. Lipman has collaborated with Schuler for over a decade. They met while working as postdoctoral fellows at the National Institutes of Health. The new device builds on an earlier device they developed in 2003. "The microfluidic device we used for the 2003 experiment was slow, and it generated a lot of background noise," he said. "By designing a mixer specifically for single-molecule measurements, we were able to obtain the greatly improved time resolution and sensitivity necessary to measure folding inside a chaperonin."